Global Economic Perceptions Are Shifting - PART I - Technical Traders Ltd. - Investment Strategies, Analysis & Intelligence for Seasoned Investors. Our researchers spent a good portion of the holiday weekend researching a continued capital shift that is taking place in the US equities markets and throughout the global market. Over the past 20+ months, a massive capital shift has taken place where investment capital fled weaker global economies and rushed into the US stock market because of a tremendous value opportunity that existed at that time. Technology, Biotech and many others equity sectors were skyrocketing – in some cases 2~3% a month. This ROI, along with the benefit of a stronger US Dollar, created a very unique environment where foreign capital could rush into the US markets, land pretty much anywhere and become relatively safe from foreign risks/devaluation. Yet, over the past 45+ days, the US equity markets have declined dramatically and our researchers wanted to investigate if this capital shift dynamic had abated or ended recently. This could be a very important question for investors to understand because the most to safety for capital is one of the most critical functions of capital preservation. Capital operates under the premise that certain risks will be allowed as long as ROI is sufficient to offset those risks. Capital tends to move away from hostile environments and towards environments that are stable and capable of generating returns with limited risks. The only time capital rushes towards high-risk returns is when managers become greedy with their client's money. Yes, these types of returns can be tremendous when there is little risk, but these high-risk returns often result in “unknowns” that can be catastrophic for investors (think Greece or Puerto Rico). Overall, far greater capital is deployed in more traditional investment sources that are lower risk and produce lower ROI as a means of supporting long term objectives. The question before our research team is “has the capital shift that we believe has taken place over the past 18+ months changed direction or changed focus and how can we profit from this dynamic?” It is our believe that capital is still searching for the safest and most capable ROI on the planet in comparison to global economic and currency risks. Has the economic environment changed so much that capital is now searching for new sources of safety and return? By focusing on these different regions of economic power and capital, we believe we can attempt to develop a better understanding of where capital will find suitable investment environments and stability over the next 12 to 18+ months and better understand how capital will be deployed in the future. The new cycle is full of concerning headlines from all over the planet. Russia and Ukraine appear to be headed into a conflict. Turkey and Saudi Arabia have already entered a war (of sorts) over the Jamal Khashoggi murder with could conflate into broader issues for Iran, Syria, Russia, the US, and many other nations. China is experiencing an economic slowdown that could result in a populous uprising if conditions don't improve soon – as we are starting to see in Hong Kong. Regions of Europe are already cracking under a severe banking/credit risk scenario with little to no hope of support from the EU. And thousands of migrants are rushing the US border attempting to flood into the US illegally as they feel it is their right to invade a nation that is offering entitlements to all invaders. If we step back and really consider all of this, the world certainly appears to be unraveling before our very eyes. The fabric of society that was in place 20+ years ago seems to be tearing apart more and more each second. As long as the US Dollar continues to strengthen above $92 and Gold/Silver continue to form a deep price base (as we recently suggested here: https://www.thetechnicaltraders.com/metals-moving-in-unison-for-a-massive-price-advance-part-ii/) we believe the US equity markets will quickly find support near current lows and attempt a new price rally that should push prices back towards new price highs before the end of January 2019. Take a look at this Weekly chart of our Custom US Equity Market Composite Index. Although the recent price decline has been dramatic and concerning, the reality of this price correction is that it has dropped to the middle level of longer-term support originating from the 2012 to 2016 price range. When we take a very long-term view of the markets, the middle (green area) of price rotation has continued to act as resistance and support for price over the past 2~3 years. In 2015~2017, this area acted as resistance. 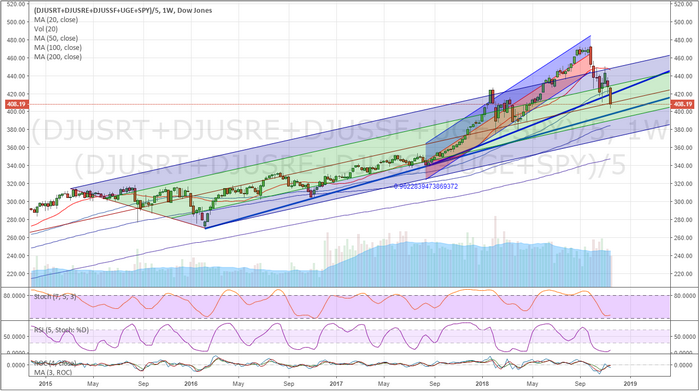 In late 2017 and early 2018, the US equity markets began a dramatic acceleration that resulted in this same area becoming support for the price (seen in Feb 2018). Overall, this recent price decline is likely a result of the US Fed prompting longer-term concerns and the US elections prompting some levels of uncertainty in the markets. How will investors digest the remaining 30+ trading days for 2018 and early 2019 in light of this retracement and new price valuation? Will these price levels be viewed as advantageous buy levels of will further pricing concerns prevent investors from pulling the trigger? We'll continue our research and attempt to more clearly illustrate our findings in the next part of this multi-part research article. Right now, think about how the global markets are set for the next 30~90 days of trading action and think about what you believe will be the likely outcome of the new year (the end of the Christmas season, the start of a new year and the continued shifting global economic headlines).